Did you know April is National Letter Writing month? Its a real thing, I promise! I decided that I would make an effort to sent some snail mail to some of my favorite people this month. Maybe a handmade card. Maybe a store bought card with a note scribbled inside. It seems like I never take the time to write a letter - a quick text or email is so much easier. I really want to concentrate on making someones day by dropping them a note in the mail. Its no fun to always get bills in the mailbox! So this month, I will be sending out some happy mail! How about you? Do you ever send our snail mail? You should try it! Leave a note in the comments if you do end up sending some happy mail this month! I loved having pen pals. I used to always send out letters. Even weekly postcards at one time. I keep thinking about doing it again but it is only thinking and not doing. I may have to just do it. 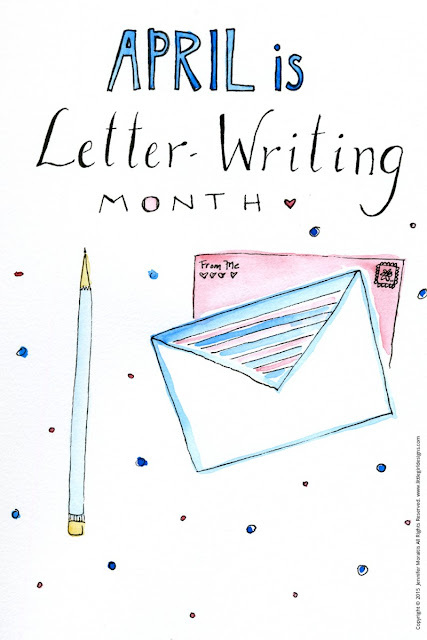 Well, since it is Letter Writing month and all. You should!! Just do it! I am going to send letters to my siblings - just quick cards, but just something to let them know I am thinking about them! have not sent snail mail in years, but ... maybe this is will inspire me. Yay happy mail! Do you belong to a card or stationary kit club? I dont - but I am thinking about picking up some pretty stationery (made Target or Hallmark?) to encourage me to get some letters out! What a fabulous idea. I have family in several states. I really should drop a card or two this week.